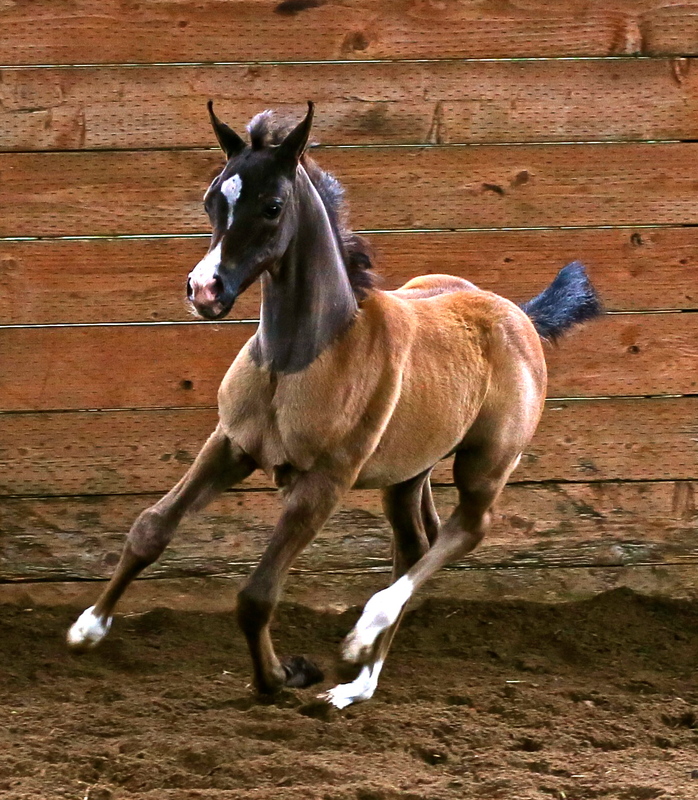 Her 2014 Filly by *Maddox Van Ryad, Madison MF, was double champion at Region IV, winning both Champion Arabian Yearling Filly (unanimous) and Champion Arabian Yearling Filly Breeders Sweepstakes. 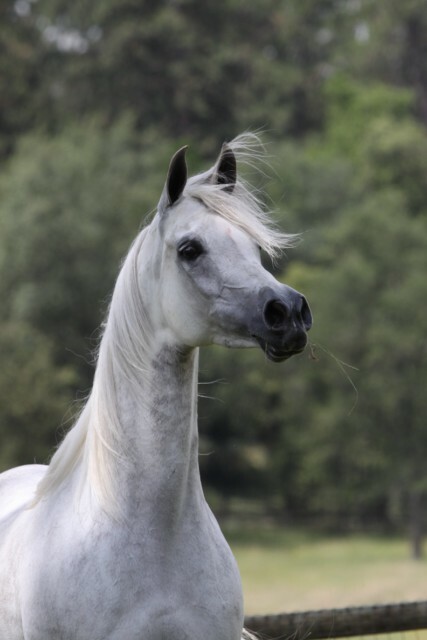 A vision in white, Benraz Magnifique is a supreme example of the type and ethereal elegance that made the Arabian horse famous. Her unmistakably Arabian beauty is characterized by a wispy forelock draping her large luminous eyes, desert-dry jet black skin, perfectly sculpted ears and an exotically shaped head that tapers to a small, finely designed muzzle. She has quality in abundance, from her stellar structure and over-the-top drama to her long and elegantly shaped neck and always flagged tail carriage. It is her commanding presence that brings all of these qualities into focus as she meets your eyes. Quality is no accident, and in the case of Magnifique it is the result of generations of carefully planned breeding by Cory Soltau DVM of Blackhawk Valley Arabians. 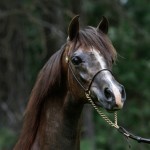 Known for their cultivation of some of the breed’s finest bloodlines, including their foundation mare TW Forteyna, leading dam of Champions in the United States, and her National Champion daughters by Bey Shah, Shahteyna and Bey Teyna, the Soltaus’ contribution to the Arabian breed is undeniable. There is no shortage of superlatives to describe this extraordinary mare. Remembering Echo Magnifficoo, we believe him to be one of the most exceptional individuals we have ever seen in the flesh. Watching his desirable traits being passed on for generations impacted the desire to own a daughter. It is his daughters who have produced National Champions Marwan Al Magnifficoo, Aria Impresario, Odyssey SC, and Art Dekko TT, to name a few. Benraz Magnifique’s dam is a full sister to Benraz Fantaasy and Benraz Fancy, both multi-champion producing mares. 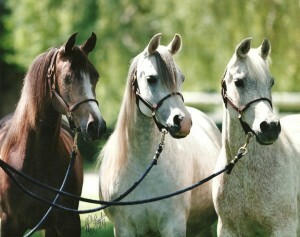 The exquisite beauty and exceptional prepotency of this glorious female family, can be seen in the three generations pictured here, Benraz Magnifique (left), her dam Benraz Jacqueline (center), and granddam Hi-Fashion Camaar (right). We anticipate that Magnifique will be a catalyst for producing future champions for Maplewood Farm. Once again, we are looking for that holy grail – the beautiful athlete. 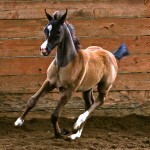 This entry was posted in Champions, Mares and tagged progeny on October 15, 2013 by Anita Enander.